Snypex Optics may not have the rich history as that of some of the best known optical brands, but these new kids on the block are already really making a splash and so far it seems to be all in the right directions. 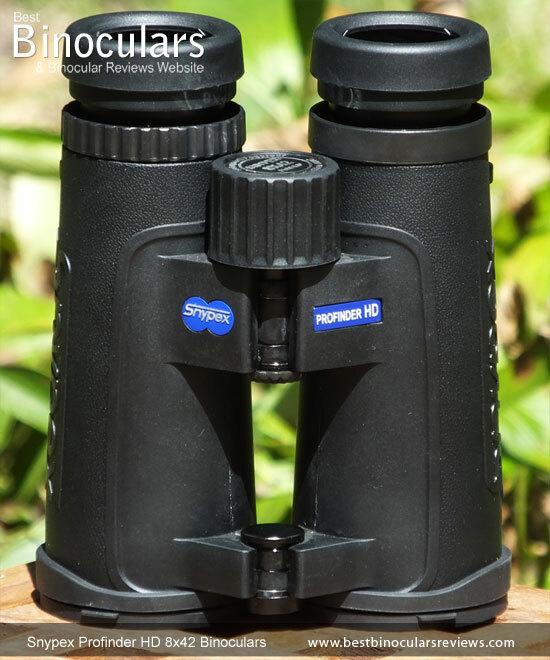 My first introduction to the company and their optics was when I got to test their flagship Knight ED range, all of which I thought were really strong, indeed the mid-sized Snypex 10x32 Knight ED was so good, it went on to win the best binocular for safaris & travel award later on in the year. Now more established, Snypex have brought out some new collections to appeal to a wider audience in an assortment of price points. Those who want a high end product and expect a level of performance to match, but don't have an unlimited budget! The open bridge shape is often favoured as it reveals more of each barrel, this in turn offers you more surface area to grab onto for a more secure as well as steadier hold, which is important when glassing and when walking with them in your hand so as to not accidentally drop them. Another minor benefit can be a small reduction on the weight of the body as potentially less material is used in it's construction, however this is often negated by the fact that more metal parts are need to make up the two hinges. The majority of bins with a similar asking price will have a polycarbonate housing, which to be fair are for the most part more than adequate in that they are both strong and lightweight, but do just lack a little in terms of strength and finish. So to discover that these Snypex Profinder's employ a higher specification magnesium housing that is usually the reserve of more costly mid to high level optics was a good surprise. This fact, along with the very similar body shape makes me wonder if indeed these use the exact same bodies as the top billing Snypex Knight ED 8x42 binoculars which would save on production costs and for the end user is a real bonus. Although most reasonably good modern bins are advertised as being waterproof, few go any further and quantify this. Snypex Optics not only state that these Profinder HD's are waterproof but they are also rated to a depth of one meter for a full fifteen minutes. So whilst I would not suggest that you go swimming or scuba diving with them, they will easily be able to survive the wettest of days or even a completely waterlogged bag accidentally left next to an open window during a rain storm... something that happened to me recently! Also remember that a sealed housing like these is an effective barrier against dust which is something that most people do not consider. On top of this, the housing on the Snypex 8x42 Profinder HD binocular is filled with nitrogen. This dry gas stops the glass inside from fogging up which can come about when you subject and unprotected instrument to a change in temperature. 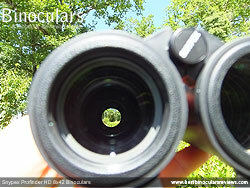 A good example would be moving your optics outdoors from a your warm and cosy house on winters day walk. 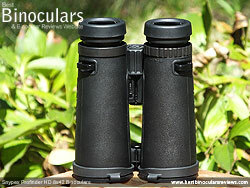 As is the case with almost every modern binocular, these have an external rubber coating for added protection, increased grip and a few other reasons that I will cover below, but first I would like to stress that whilst it may not be immediately obvious to the casual user, the covering on these is unquestionably superior to many that I come across. I say this for a number of reasons, but probably most significantly, it just fits better and much tighter onto the housing underneath it than most. For me this is a real sign of quality as many rubber armors on mid and low end binos can quite easily be lifted in places like around the objective lenses and the bridges. This usually is not a big problem if you look after your optics, but on some it can become looser and eventually start to slip. Even if this does not happen, these lesser fitting and often much thicker rubber coatings just never give off the same feeling of quality as ones like these. Other small signs of quality include the small details around the neck strap eyelets and the fine textured sections around the barrels that will raise the grip levels a little. Colored black and bar a few very small parts, the coating covers almost the entire exterior surface and unlike many this also includes the central bridges. For some uses like birding, hunting and security this somewhat small detail can be vitally important as it minimizes the parts of the bin that are highly reflective and also acts as a sound damper and thus raises the instruments 'stealth' and camouflage to another level. With the increase in popularity of using your smartphone for digibinning, being able to get a completely steady view by mounting your bins onto a tripod has never been more important. 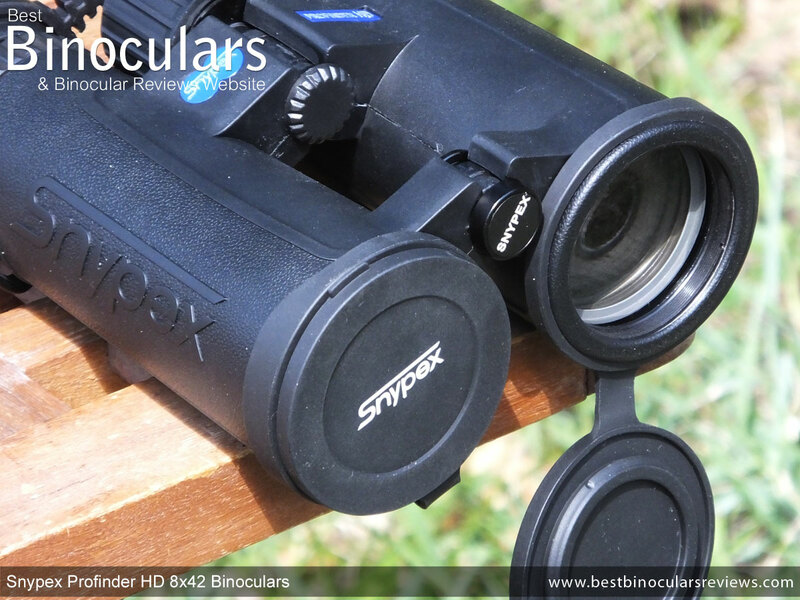 Indeed the majority of full sized bins that I test are able to accept a tripod adapter, however these go one further as it is technically possible to fix one to two different points on these Snypex binoculars! This is because both bridges have a dust cap that can be removed and both use the same standard thread that will accommodate the adapter. However due to the length of my adapter, I was only able to actually fit mine to the front hinge, which is fine. But for those who have a short adapter that can fit in between the bridges, it will be nice to have the flexibility and by using the inside fixing point, you will get a more of a balanced mount onto the tripod. Like their main body housing, the eyecups that twist-up on these are of a higher specification to most in this range that will have a plastic shell. Indeed I feel that the importance of the metal housing on the Snypex eyecups is worth emphasizing as this is the part on the body that most often gets damaged. This metal shell is then covered in a thick rubber coating and whilst it is quite hard, it has smooth and rounded corners and so effectively helps them to be more comfortable. So whilst they may not be the most comfortable cups I have ever used, I would not call them uncomfortable and the hardness of the rubber will ensure their longevity. The actual twist-up movement of the cups is nice and smooth and here again is an area where you really can feel that little bit extra that you get with a metal eye-cup as it just feels well made, more durable and works better than almost all plastic ones. This Profinder does have a click-stop mid-way between extended and retracted to give you a little more flexibility when making sure that your eyes are the correct distance from the ocular lenses. Whilst it is true that some do have two or even more intermediate stops, I feel that there is just enough resistance to enable you to stop the cup at any point you desire and use them. The eye-relief on these is also an excellent 19mm, which along with the great twisting movement, makes them an ideal choice for eye-glass wearers. 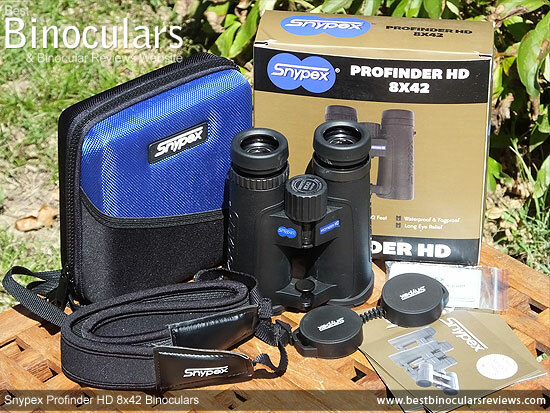 A strong feature on these 8x42 Snypex Profinder HD binoculars is the wide range of movement you get when opening and closing the central hinges which covers more distance than many. This in turn means that their eye-cups can be moved closer or nearer together to cater for a wider variance of people. Indeed with a minimum Inter-Pupillary Distance of only 5.9cm and a maximum of 7.9cm these should be fine for older children with narrower eyes, right through to the most adults. Positioned in the standard location and at 31mm in diameter, the focus wheel is nice and large and easy to reach from the standard position when holding your bins. Whilst smooth from one end to the other, the mechanism on my test pair turned with perhaps a fraction little too much friction. Still I prefer this to a wheel that turns too easily as these accidentally get moved out of the correct focus too easily (especially when passing on your bins to someone else to view something). The wheel has a rubber track running around it that helps with grip and I had no problems making accurate adjustments when testing it whilst wearing my winter gloves. Taking 1½ turns (540�) of the wheel to go from near to far focus, the gearing is what I would describe as being fairly neutral and so nicely balanced between speed of making big adjustments and accuracy when making fine changes. Like all good binoculars, these have a diopter that enables you to make allowances for any differences in the vision between your eyes and is an important step to properly setting up your binoculars. 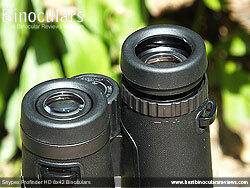 Like most, changing the diopter setting is achieved by turning a wheel that is positioned on the right eyepiece. Because in theory you only really need to make this adjust once (more if you share your bins), the best ones are lockable and whilst you can't lock the one on the Profinder HD, it does have a fine ratchet mechanism and is tight enough that I feel it will vary rarely move other than on purpose. The lack of a scale with more markings is one very small detail that I do feel is missing as this makes it easier to return it to your setting should it be moved or when you share your bins. Snypex publish the weight of the 8x42 Profinder HD as being 26.8oz (760g), however I feel that they are doing themselves a slight injustice as I measured their weight as being 710g which includes the neck strap and both the objective and ocular lens covers. The bin by itself weighs 629g and if you add everything including the carry case the weight comes to 922g. As you can also see from the table above, their advertised height and width dimensions are fairly standard for a full sized binocular. However they do look and feel small for a bin in this size class, which I think is down to their length, which at only 5.31in (13.5cm) is a little less than most others. Note their length increases to 14.5cm with the eyecups extended. 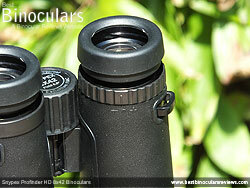 The ocular lenses are 21mm in diameter, which is there or thereabouts for a full sized bin. However other than this I have no further information as to their exact make-up. The 42mm diameter objective lenses are positioned approximately 7mm in from the end of the body. Whilst there are some that are deeper, this is also more than many and offers them a reasonably good amount of shelter and protection. 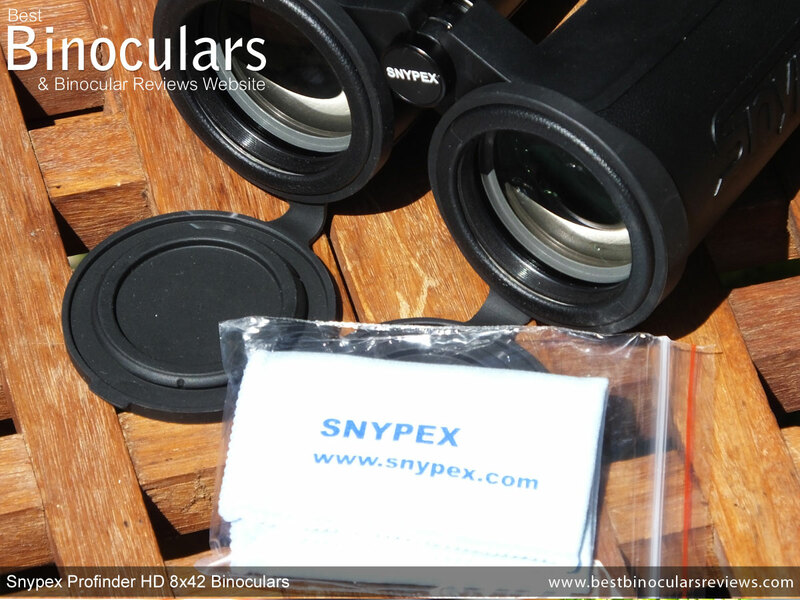 Like the ocular lenses, Snypex do not offer any information as to exactly what glass is used or indeed how many elements there are in their objective lenses. Modern lenses are made up of a number of elements glued together, each of these elements has different properties and when designed well, can direct the individual wavelengths of light better, thus focusing them far more accurately than a single element lens can. What I can say is that because of the fact that they do not highlight it (as they do with the Knight ED series), they do not have an apochromatic (APO) lens design (3 elements) and rather have the far more common achromat lenses with 2 elements. At this price point this is totally understandable, indeed I don't think I have ever come across an APO bin in this price class and I am merely pointing it out as one of the main differences between these and their higher spec Knight ED's. The lack of ED glass element is also another one of the main areas where the Profinder HD differs from the more expensive Knight ED series and whilst the Snypex Profinder HD 8x42 binocular will most certainly have some sort of low dispersion glass in their lenses, they do not use extra-low dispersion glass. It is important to note that whilst this omission helps to reduce manufacturing costs, it does not always equate to vastly inferior view when compared to a bin with ED glass. It is true that if very carefully designed and used 100% correctly, ED glass can contribute to a higher resolution image that has lower levels of color fringing around the edges of objects in your view, this is not always the case and I have often preferred the view of a well designed non ED bin to that of an average ED one (or at least thought it equal). As you will read more about in the Image Quality section below, these do exhibit a certain level of color fringing, but I did not find it to be excessive and not much more (if any) than on many mid range ED bins I have used. Snypex Profinder HD binoculars all use roof prisms to upturn the image inside them. These prisms have been fashioned from BaK-4 glass. No further details are given, but even if as is the case with most others in this range and they have used the less expensive Phosphate crown BaK-4 glass that has larger bubble count than the best Schott Barium crown BaK-4 glass, it still a good thing and reckoned by most to surpass bins that use BK-7 glass. Snypex make a point of highlighting the fact that the Profinder HD is Fully Multi-Coated - indeed it is also stamped on the focus wheel (FMC). It is important to take note of the exact wording in this area as what this means is every single surface of glass in the instrument has more than one layer of an anti-reflection material added to it. As is demonstrated by the illustration on the right, the benefit of this is that it means less light gets reflected or even directed in an unwanted path. The outcome is a superior quality and more brilliant image than bins that are only Multi-Coated (some surfaces have a multiple coating) as well as bins that are advertised as Fully-Coated that only have a single coating. The different wavelengths of light that passes through the roof prism will jump slightly out of phase. To reduce manufacturing costs, this will be left as is on some optics, with the slight reduction in the contrast and resolution being the result. This is why it is good to see that Snypex have not compromised in this area as their prisms have special phase correction coatings added to them. As the light bounces around a roof prism, there is one face that does not reflect all of the light that hits it, this results in less light passing through the optical system and thus you get a less bright and image with less accurate colors being produced. To counter this, highly reflective coatings are sometimes applied to this surface. As you can imagine these are not all the same and cheaper optics will often lower quality coatings, which are still better than leaving them uncoated, but do not offer nearly as high reflectivity levels as the very best dielectric coated prisms. Dielectric coated prisms are expensive and so are not always found at this level, so I will assume because of this and down to the fact that Snypex don't shout about it, these Profinder HD's are not dielectrically coated. My guess is that they are most probably Silver coated, which is the next best option and what I usually see at this price. If anyone should know for sure or have any further information for me, please leave a comment at the bottom of the page. A feature that I don't often find on a mid priced bin like these is the addition of water repellent coatings on the exterior lens surfaces. So to learn that they are added to the Profinder is a great news. These coatings improve glassing in wet conditions as the droplets simply roll off and thus don't spoil the view. On top of this it means that the lenses will require less forceful as well as less frequent cleaning as they will not be marked with water stains quite as much as those that don't have these coatings. 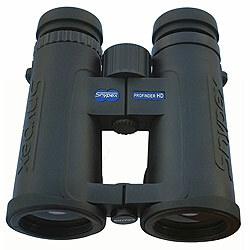 The 8x42 version of the Profinder has a view that is 357ft wide at a distance of 1000 yards (119m @ 1000m). This translates to a viewing angle of 6.8 °. 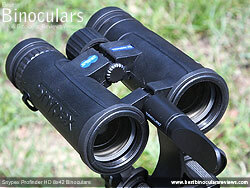 As the comparison table below clearly demonstrates, this is a little on the narrow side for an 8x42 binocular. I would like to stress however that whilst looking through them I never hand any sort of sensation that the view was particularly narrow, but for those looking for a specifically wide view, this may be of a slight concern. 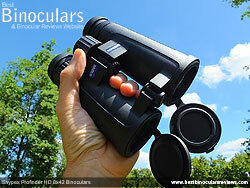 A really strong area of these is the 19mm of eye-relief which puts them up there with other long eye-relief binoculars. 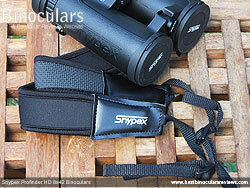 This added to eyecups that adjust well make these Snypex binoculars an especially good option for eyeglass users. A full sized binocular with a close focus under 6ft is considered to be excellent on BBR. These Profinder's have an official measurement of 5.6ft, whilst I measured the close focus distance on the pair I was testing at 184cm (6.04ft), which is a little longer than their official measurement, but either way these are a great choice for those who are also interested in the occasional near distance observation - butterflies, insects, flowers etc. 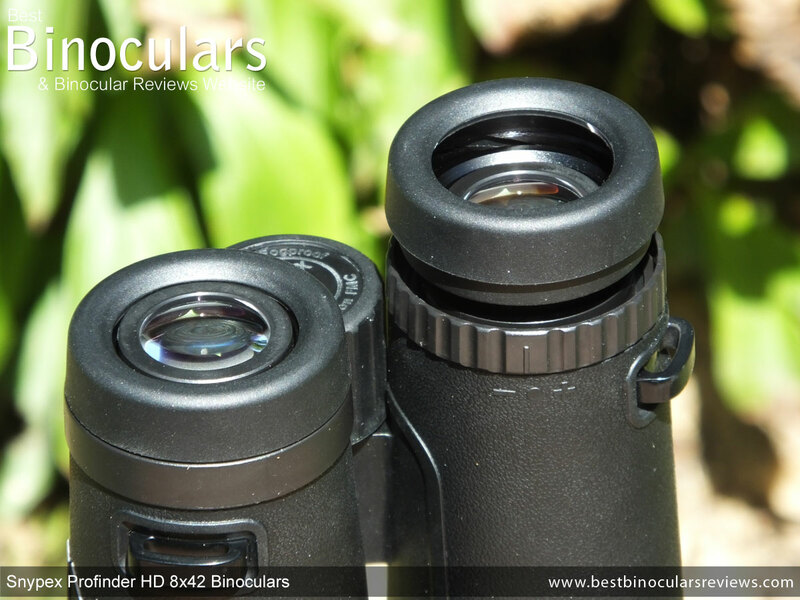 The most impressive specifications and stunning quality components mean nothing if the actual view you get is not great, so I guess out of every section in the review, this is the most important... however it is always also the most difficult for me to judge and to write about! This is because there are so many factors involved and your perception of a view or even an element of it can change in different conditions or situations. Thus to help me be as unchanging as I possibly can, I compare the image of instrument under review against a number of control binoculars that I use for all my reviews and rank it against that. I also carry out these tests in both fine and poor lighting. 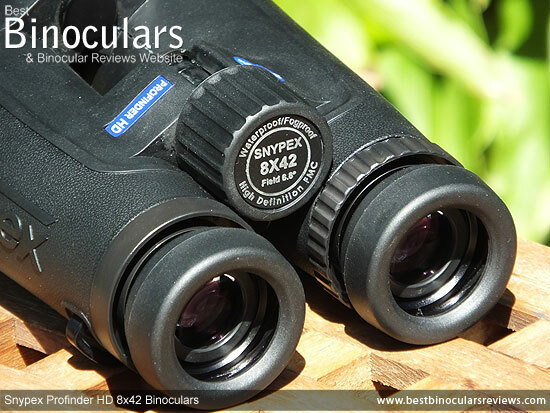 In general, my thoughts were that the colors produced by the Snypex Profinder HD 8x42 binoculars were reasonably vibrant, but I would also say fractionally less than what I observed through my very high end control bins but this was negligible. In what I would describe as "normal" light conditions, they display what I felt was a good level of contrast that gives you a nice feeling of depth, but not too much so as to look unrealistic. When there was plenty of ambient light, the brightness of the 8x42 Profinder HD looks to be an equal in terms of brightness to that of my mid and high level 8x42 control bins. 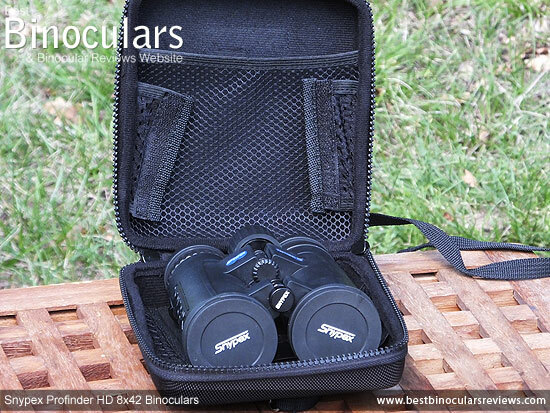 This is completely understandable as 8x42 binoculars, with their wide 5.25mm (42÷8) Exit Pupil's should provide your eyes with more than enough light in all but the poorest circumstances. I bad light, the Snypex was to my eyes the same as my mid level 8x42, but both were less bright than my high end control, but the amount was very minor and really nothing to be unduly worried about. 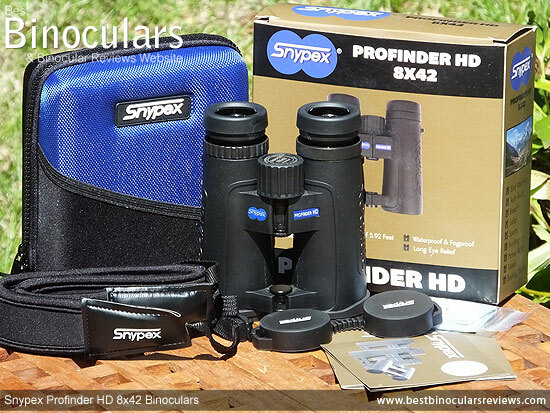 As I briefly covered in the optical components section of this review unlike their top of the range Knight ED's, these Snypex Profinder HD's do not have an extra low dispersion (ED) glass element in their lenses. Potentially ED glass can help reduce some chromatic aberrations, which in turn reduces the size of the colored halo known as color fringing that you will sometimes observe around object edges. However I have found that a very well designed "normal" low dispersion glass bin can do as well as many average ED glass bins in this area. Whilst there was more than what I observed on my high end ED glass controls, I found that the level of color fringing on these Profinder HD's to be acceptable, which means most of us will only really notice any whilst actually closely observing the edges of objects and only when the object in question is in stark contrast with it's background. Other distortions that I sometimes observe include "pin-cushioning" or "barreling", where the view looks to curve either inwards or outwards when you move your gaze around the image, but neither of these were obvious on my sample Profinder. The sharpness of the view also continued right to the edges, with only a fraction of blurring right on the edges and in this area the Profinder excels and is as good as any in this or even higher levels. I was amazed to find that these Snypex Profinder HD binoculars come with exactly the same carry case as that which you get with the Knight ED series. The reason I say this is because this rigid case is excellent and I thought was one of the best I hade ever seen and that was when I was reviewing the 8x42 Knight ED and thus comparing them to those that are supplied with other much more expensive high end optics. So to find the same ones included with what is a mid level instrument is superb and almost certainly the best carry case you will get in this class. I don't want to repeat myself by going over it all again here (an thus risk the wrath of Google's duplicate content penalties! ), but you can read a detailed review of this case on the Accessories section of the 8x42 Knight ED Review here. I also think, from memory and by looking at the photos that the neck strap that you get is the same as that for the Knight ED series. It is very well padded (approx. 7mm thick), has a non stick neoprene underside to the neck and shoulder section. This part is also slightly curved so as to offer a better, more natural fit which increases comfort further. The strap fixes onto the instrument in the usual way, using thinner nylon straps that you thread through the eyelets on the barrels and then back on themselves passing through a slider so that you can alter it's length. These nylon sections are fixed to the padded section via a couple of trapezium shaped sections, which are made out of a soft plastic, have the Snypex logo printed onto them and sewn onto the strap. The stitching on these looks good and so I doubt will come apart very easily. For me these sections just look a little cheap when compared to the quality of the case. However other than that the strap works very well and is more than comfortable enough. Once again the objective lens covers look to be exactly the same as the Knight ED ones, which once again is great news as they are great. The rain-guard is slightly different in that it has Snypex printed on the cups rather than being embossed. But other than that the design is the same. 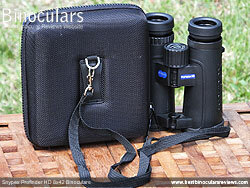 The fit over the eyecups securely, but are not difficult to replace or remove and the bridge that holds the two cups apart is nice and flexible which permits you to store your bins at your preferred IPD setting (inter-pupillary distance), unlike some where you have to open the binoculars hinges to put it on. The guard also has eyelets on the sides which you can use to attach it to your neck strap. The supplied cloth for cleaning is of a very good quality and superior to most at this level. This for wiping the body and occasionally the lenses when out in the field this will be fine. For thorough cleaning of the lenses I would still suggest a specialist lens cleaning kit to make sure you do not damage the optical coatings. 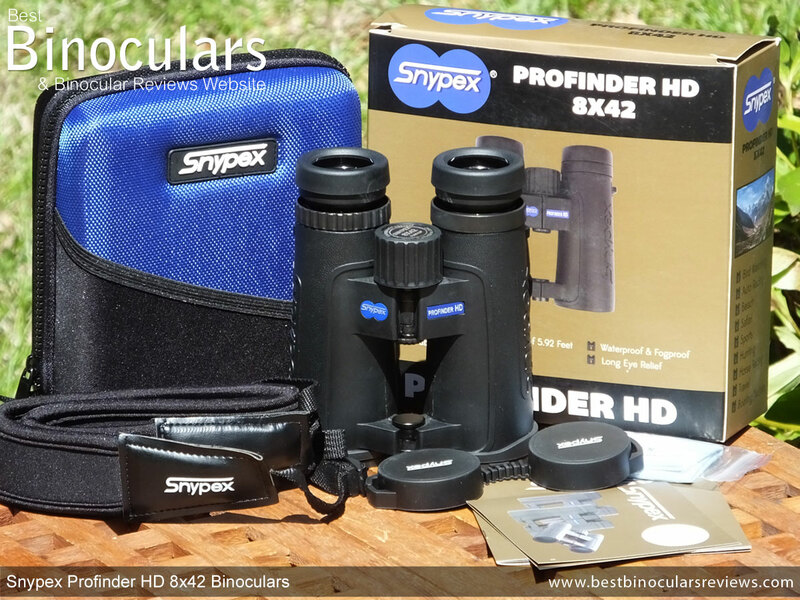 The Snypex Profinder HD 8x42 binocular comes with a 3 year limited warranty. Details of which are supplied on a separate card within the box as is the warranty registration card. Written only in English, the instruction booklet is common to all models within the Profinder HD series and which includes all the usual info on how to set-up, use and then care fro your bins. It also has a specification table at the back. 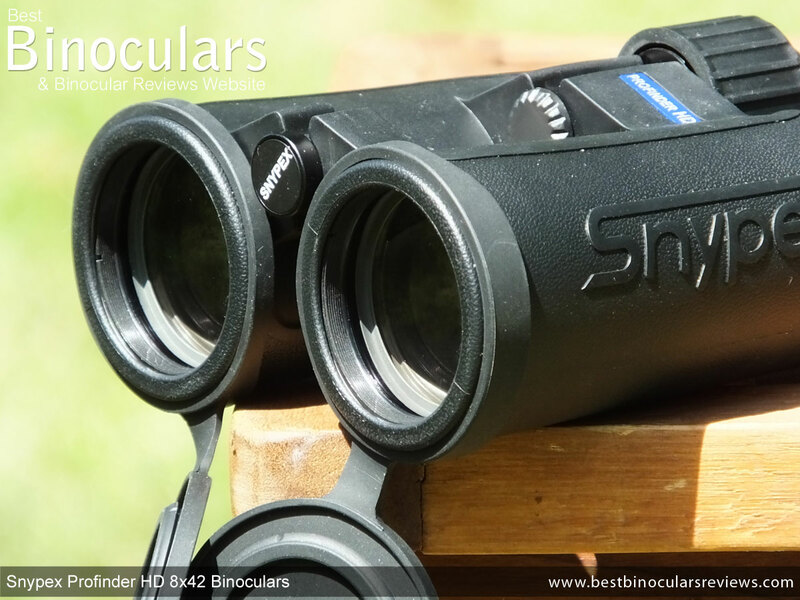 Good quality optics encased and well very protected in a very high quality chassis and all at an affordable price, there is no doubting that these Snypex Profinder binoculars rank up there with some of the better mid-range bins that I have tested. 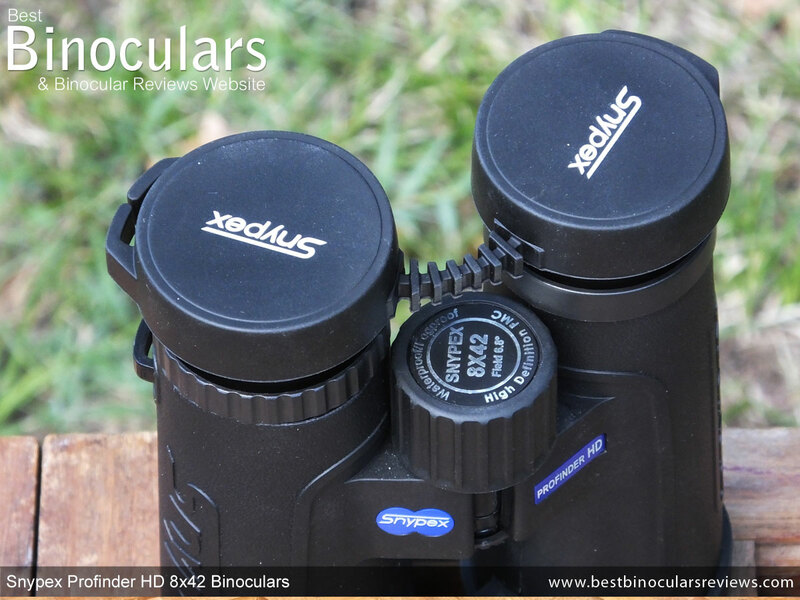 Strong Points: For me their general build quality and the close attention that Snypex Optics pay to the small details is something that really stands out for me and whilst I expect to see it on the most expensive 'alpha' type bins, it is not something that you are guaranteed in this price range. 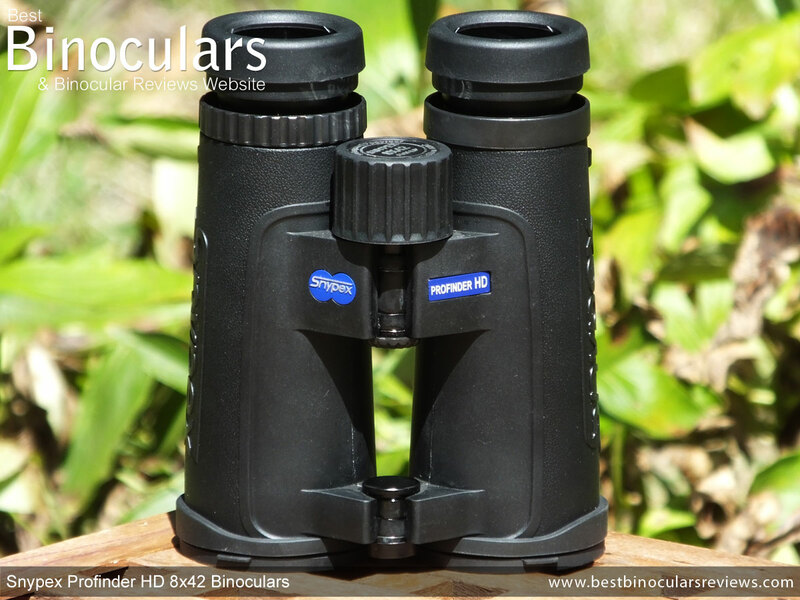 This begins with a top spec magnesium chassis that has a high quality rubber armour and runs right through to the lenses that contain water repellent coatings. Combine this with their other optical coatings it makes sure that you are presented with a bright and good resolution view. 19mm of eye-relief is superb, which when paired with their quality twist-up eyecups makes them a great choice for eyeglass wearers. Whilst it may not be the first feature that most people look for in a binocular, the minimum focus distance is very good and means that these can be used for a much wider range of uses making them a far more versatile instrument. Also well worth highlighting is the excellent quality accessories (carry case, neck strap and lens covers) that come supplied with the Profinder series, which once again surpass most at this price and easily match that which you get on much higher levels. The semirigid carry case in particular really stands out and indeed is the same as that which you get on Snypex's top of the range Knight ED series bins. Weak points? Considering their price point, I don't feel that there are any particular weaknesses that are so bad as to become a deal breaker and you always have to remember that compromises have to be made, especially when you are aiming to keep the overall cost down. So whilst it may be a temptation for me to state that the omission of extra-low dispersion glass in the lenses is a weakness, the actual image that you see exhibits no more color fringing that I see on many bins that do have ED glass at this level. I think the one area that perhaps these do fall a little short when compared to the best 8x42 binoculars is the field of view. For most users this will not be a problem at all, indeed unless you compare them against a set with a really wide FOV, it is not even obvious, however there may be some that specifically want a very wide view that may be concerned.